Prospective clients always ask: "Is the result really long-lasting? What happens if hair falls out again? 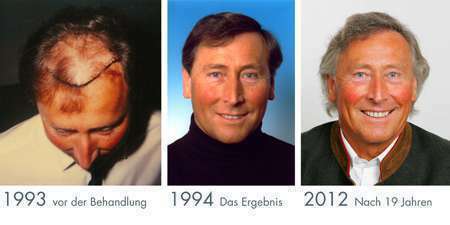 Can you see the transplantation when you get older?" 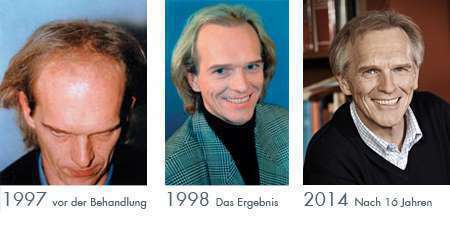 The answer lies in these examples, Moser patients who were treated 23, 22, and 18 years ago. Mag. Peter Thunhart: "I first want to say, I waited too long. I walked around with a bald head for five years - totally unnecessary! In 1997 I decided to get a hair transplantation and in 2012, 15 years later, I got a follow-up treatment to touch up small bald spots. 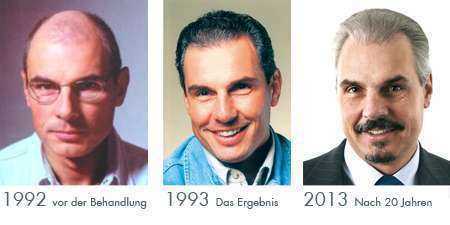 This was only possible because even in 1997, Moser was thinking ahead and left enough donor hair the first time to make a second treatment possible." Do you want to improve your own hair-loss situation? Sooner rather than later? If so, arrange a free consultation appointment at our location nearest you. We'll take a look at your hair, undertake a microscopic analysis, and come up with a personalised solution - from a purely medical treatment to the transplantation of your own hair.